The tuberose flower, sweetly and narcotically scented, comes from Mexico. It is used in Mexican cuisine, weaving its floral magic in desserts. 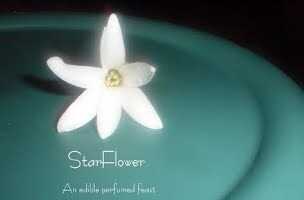 StarFlower Perfume and EdP is my homage to tuberose and the stellar fragrance beauties that also come from Mexico, chocolate and vanilla. Their unctuous natures are cheerfully masked - briefly - by a bitter almond and lemon opening. Then the deep, dark, sensual Mexican "perfume mole" unfolds on your skin, silky, smooth, seamless, a symphony of floral and foodie delights. Notes include bitter almond, lemon, tropical flowers with a rich dose of tuberose, foodie seeds, chocolate, vanilla and some animalic playfulness. Sounds delicious (a bit scared by the chocolate and the foodie seeds, though). I’m on a tuberose kick, lately – so anything marketed as tuberose fiend is right up my alley! Keep telling myself the set (and esp. the refills) does not seem expensive anymore! And I like it much more than the key-laquered-satin box packaging. LOL…it’s still expensive, but if you love it, go for it! Oh, you know, that’s what I hoped to hear !!! Now I should find a red lipstick or killer heels to go with it (it = the perfume AND the black retrò purse spray). HA…if you were hoping to be discouraged, you’ve come to the wrong place! Wow – thanks Miss Kitty V – good to know! I didn’t know that tuberose is sometimes used as a culinary ingredient. We learn so much here @ NST. Sounds great – although I’m also a little frightened by the “foodie” seeds and the animalic note at the end. Every time I try something with civet or animalic in the notes, it turns to cat pee on me. Oh, too bad! I love civet. Almost no way there’s real civet in this though. Weird place to put this, but, does anyone remember the musk, civet and ambergris oils from the 70’s – by Jovan, I think? I wonder if they were the real thing? No, only the musk! And hard to believe they could have used ANY real animal-derived ingredients at the price, but who knows. Maybe my nose will evolve into it, like it did with white florals, chyrpes, and aldehydes. On a more amusing note, I finally tried Guerlain AA Pampelune in Sephora last week (on skin) and was wandering the store waiting for the drydown to kick in when an SA approached to see if I needed help. I looked at her and said (cheerfully), “Oh no, I’m fine, I’m just waiting to see if this stays grapefruit or morphs into cat pee.” She said, “umm, okay, good luck with that” and backed away slowly. Unfortunately, it did morph into cat pee on me – so the search goes on for a good grapefruit scent. Do try DSH Pamplemousse, if you haven’t. Cynthia: Yeah, I get the Pamplelune cat pee thing too. That’s a good tip for getting rid of Sephora SAs though. My fave grapefruits are Jo Malone & Balle de Match; if you want samples, ask Daisy for my info. I definitely need to try some DSHs and that’s definitely on my list. There was a great sampler pack that I was looking at and never pulled the trigger and I’m pretty sure that the Pampelune was in there along with the Wasabi, Lime and a few others that I wanted to try. Thanks, Joe, I’ll definitely get your info from Daisy! Oh, and there’s also that Hermes Pamplemousse Rose, which I thought smelled great, but lasted all of ten minutes on my skin. As they say, your mileage may vary. Anya would need to confirm for sure, but I am pretty sure she uses castoreum….the real deal. I’d definitely be curious to try this; I wish it were easier to get Anya’s samples at a low price. It’s true that $7 per sample is pricey, but for an indie all natural brand, it’s not bad. Not that that helps you, necessarily. I don’t mind paying that for a sample so much, but once shipping is added… oh la la… pretty much means I won’t be trying it. I’ve gotten so spoiled by places with free shipping that I forget anyone even charges for it. I ordered some decanting bottles and couldn’t figure out what I got that was so expensive…turns it out it was the $15 shipping charge. It feels like throwing away money. They generally don’t last as long as synthetics. A gourmand-animalic tuberose? This sounds seriously intriguing! I’ve heard dubious things about naturals’ longevity, though…. They aren’t always long-lasting…if long-lasting is your primary objective, naturals might not be your thing. Seriously, so lasting power is your main objective? I’ll sacrifice lasting power for other things (although in my case, artistry more than natural vs synthetic) any day. For me, it depends on the price point. For low to mid-range prices, it can vanish quickly and I won’t mind. But for high-end frags, I’d better get at least 6 hours out of it (and to be honest, if it’s not gorgeous, it’d better be more like 8+) or I’m not buying. I ‘ll agree with Boojum. And most things disappear pretty fast on me, so if it’s already short-lived in nature, I will end up disappointed. Well, can’t argue with that…but wouldn’t wipe out all naturals just because of it…some last longer than others! Robin’s right, it depends what natural you are talking about, and it can vary within a line. Strange Invisible’s Magazine Street lasts all day on me, as does In Fiore’s Vetiver Sambac. In fact, I had to shower after 6 hours yesterday to get it off when I wanted to change to something else for the evening. Liz Zorn’s naturals have amazing staying power, unbelievable really. So if you’re intrigued by the artistry as Robin says, by all means, do not dismiss them b/c they are naturals! anyway, bitter almond?? is there any perfume with bitter almond notes? wahh thats unique! I think there are several perfumes with bitter almond. I thought osmoz had a search function but I just looked and it’s not easy for me to find. In any case, I think the following have it: Castelbajac, Hypnotic Poison, Acqua di Parma Mandorlo, SL La Myrrhe, etc. Basenotes has a note search function, and if you search here for “bitter almond” you’ll find quite a few. Oops…that was my mistake, sorry! And don’t know if the prices went up, I think it was just a typo on my part.